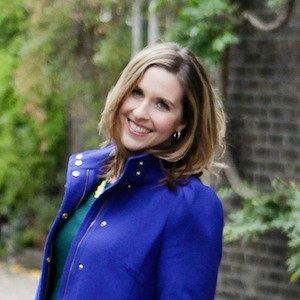 For my first adventure, I’m working with a fruit that inspired me to start this blog. There I was searching on one of my favorite websites, The Pioneer Woman, and I stumbled across this amazing cooking community she has called Tasty Kitchen. Full of recipes and how to’s, I found a link that caught my attention. I’m taking on what some might think is arguably one of the weirdest foods we have. 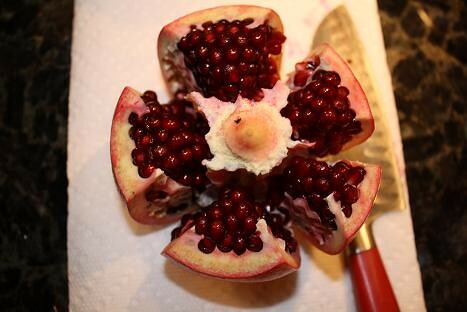 Let me introduce you to the pomegranate. She looks a little strange on the outside, but nothing can prepare you for what you see when you cut into the fruit for the first time. I have found some interesting links to give you plenty of choices in how you open the fruit to get the bizarre seeds inside. I’m sure there are even more than what is listed, but the link that inspired me to write this is a good place to start. Just click here. I opted for the segmentation method, which I’ve found is not terribly messy (as you’ll see in the image below) and is the best way to see for yourself the inner workings of this fascinating super food. I urge you to open one for yourself solely for the experience, but fear not, my friends, lots of grocery stores sell these gorgeous arils already seeded for your convenience. Okay, now that we’ve gotten to the seeds, let’s back up for just a tick and talk about this fruit. I first ate it in Mrs. Vest’s Mythology class in junior high, so obviously this fruit is linked back to the Ancient Greeks and their myths about their deities. While this may be the fruit of the gods, it still looks like it came from an alien planet to me! Despite it’s odd appearance, the benefits of this fruit are truly amazing. I know that opening up the fruit can be a bit daunting, so keep in mind as you’re making your way through this process that this hard work is worth it. There are so many health benefits to pomegranate arils that you just need to power through. Just keep telling yourself: You’re welcome heart, cancer be gone, diabetes and arthritis take a hike, ooh I feel healthier already. There are a lot more benefits, which you could read about here for specifics, if you’re into that sort of thing. Okay, now let’s get down to how I spent my week. 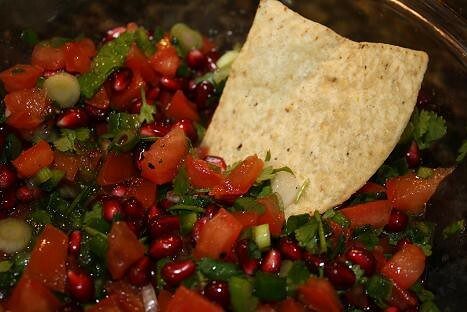 I was searching for some interesting recipes using pomegranates, and I found myself right back at the Tasty Kitchen site where they had a plethora of recipes to choose from. I couldn’t believe my eyes, but there were so many choices, so I picked four recipes to try out. Isn’t it perty?! 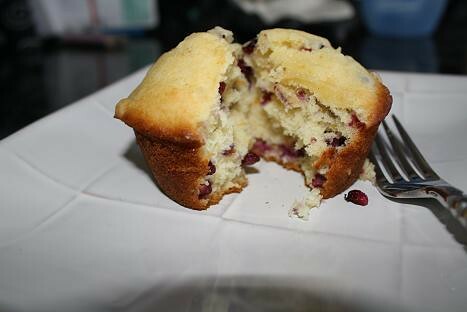 I highly recommend these muffins. Especially if you are looking for a breakfast treat that is a departure from your normal, boring routine. I’ve been enjoying mine with my morning hot tea or coffee. For step by step instructions on how to make these, click here! Let me preface this one by saying that I’d never made salsa before, and I don’t like cilantro. (That’s a lie, I do adore Chipotle’s cilantro rice and could eat it for every meal.) Under regular circumstances though, cilantro is not my favorite ingredient. Despite this recipe having cilantro in it, I was so curious how this would taste that I had to make it. I have to tell you that it was so worth all of the time I spent chopping up the ingredients for the end result. First of all, it is so gorgeous with all of the reds and greens. Second of all, it was incredibly fresh and healthy, and my roommate and I couldn’t stop eating it. If you ever enjoy eating salsa, do yourself a favor and click here to get the recipe. You will be so very happy you did. Delightful!! 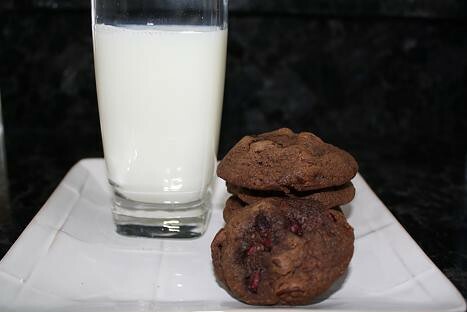 Yes, I said chocolate and pomegranate and cookies in the same recipe. It sounded weird to me, but I’m a chocolate fanatic, so I had no control. This recipe was immediately on my list for the week. 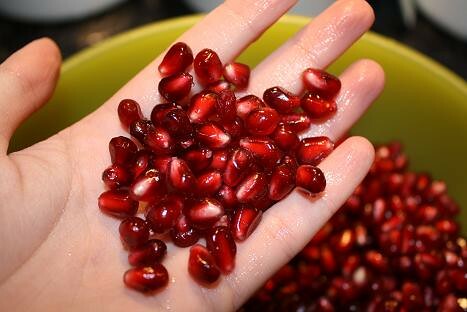 Pomegranate arils are really the prettiest thing. After my week working with them, the one thing that is apparent is that they really seem to class up any dish you put them in. These cookies are chocolately and chewey, which defines a perfect cookie, in my humble opinion. With the addition of the arils, they add an interesting burst of juice when you bite into the cookie. If you are looking for a cookie recipe with a twist, click here to get the recipe and step by step instructions. 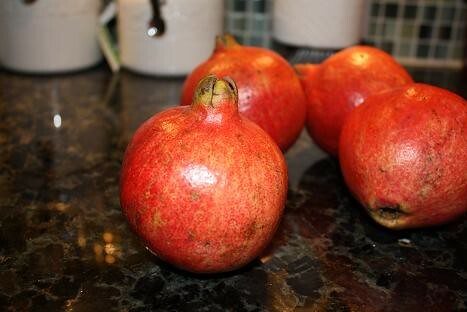 My final recipe on my pomegranate adventure involves a veggie that I believe gets a bad rap. I have eaten and loved Brussels sprouts my whole life, and I wish more people would give them a chance. I know some of you might be a bit skeptical about Brussels sprouts, but give them a try. 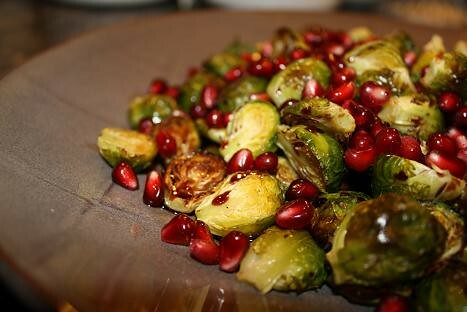 This recipe dresses this veggie up with a glaze that is both sweet and slightly tart and then the burst of juice from the pomegranate arils also enhance the Brussels sprouts. For those of you that love these tiny cabbages, you’ll love this recipe. Roasting the brussel sprouts gives them a slightly nutty flavor and the glaze is really tasty. Click here for the recipe if you want to give this one a try! **All of these recipes can be found on the Recipes page at the top of the site with lots of pictures, or you can click on the individual links above to see the recipe and step by step instructions on its own. Hey Tim, I did see that as an option too. One of the people in that link commented that they love removing the seeds that way. I think I'll try it that way next time I'm looking to get out some aggression. Thanks!! I'm not sure if they listed this way of removing pomegranate seeds or not in the link above, but I learned a great way watching Iron Chef once. 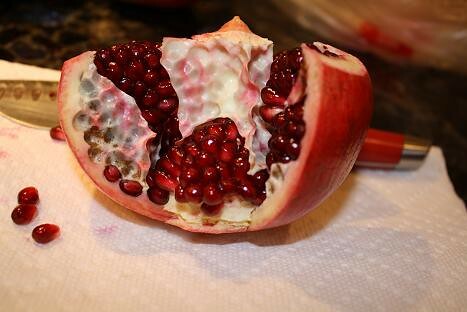 They cut the pomegranate in half, held a half face down over a bowl, and pummeled the top of it with a large spoon. It works very well!